Welcome to the website of the ICA Commission on the History of Cartography. To receive news and updates please register here to become a member of our commission . 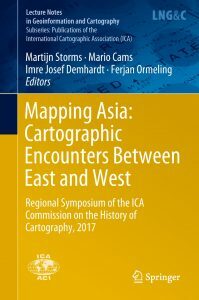 The ICA Commission on the History of Cartography and ICA Commission on Topographic Mapping will jointly organize a workshop to precede the 29th International Cartographic Conference in Tokyo. The focus will be on both western and eastern cartographic practice from the early modern era until the early 20th century. More information can be found here. It is now possible to submit abstracts for inclusion in the programme (deadline 20 April 2019) and to register for the workshop (free of charge). It is a tradition that the International Cartographic Association and the International Conference on the History of Cartography jointly organize a pre-ICHC event. For the 28th ICHC they have teamed up with the Map Collection of Utrecht University and will together host a workshop focusing on the cartography of water. More information can be found here. It is now possible to register for the workshop (free of charge). The Proceedings of the Commission’s Regional Symposium “Mapping Asia” which was held in Leiden in September 2017 are now published. Buy them here.